The Esty Ranch operations consists of three previously independent ranches within a twelve-mile radius of the town of Gunnison, Colorado. Historic Esty Ranch itself is located three miles north of Gunnison, and borders approximately one mile of the Gunnison River in the scenic Gunnison Valley. Esty Ranch is a 457-acre property at an elevation of 7,900 feet that is dedicated to the production of top-quality Timothy and mountain meadow grass hay and Simmental/Black Angus cross-bred beef cattle. The hay produced on Esty Ranch is sold throughout Colorado and other states to feed pleasure and rodeo horses, and is especially valued for prize racehorses. 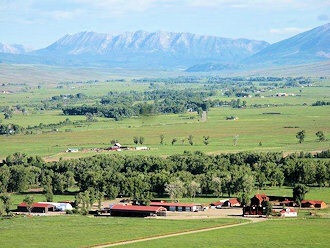 Originally homesteaded in 1880 by John B. Outcalt, this ranch was owned and operated by the Outcalt, and later Esty, families for over 100 years, resulting in recognition as a Colorado Centennial Farm by the Colorado Department of Agriculture and the Colorado Historical Society. The 409-acre LeValley Ranch, located eight miles east of Gunnison, is at an altitude of 7,800 feet. The Tomichi and Cochetopa creeks run through this property. Vader Ranch, which is located approximately eight miles east and two miles south of the town of Gunnison, contains approximately 531 acres at an elevation of 7,800 feet. The Cochetopa Creek flows through this ranch. All totaled, the Esty Ranch operations consists of almost 1,400 deeded acres, 1,000 plus of which are extensively flood-irrigated hay fields, and 37,206 combined acres of U.S. B.L.M. & U.S.F.S (United States Bureau of Land Management & U.S. Forest Service) permitted grazing rights.